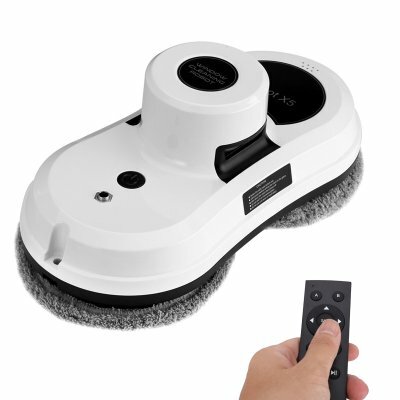 Successfully Added Robot X5 Window Cleaner - Remote Control, Phone App, Backup UPS 600mAh, 4 Cleaning Modes to your Shopping Cart. The Robot X5 window cleaning robot comes with 12 months warranty, brought to you by the leader in electronic devices as well as wholesale smart home gadgets.. This thing works great. I used regular automotive washer fluid in a spray bottle. My 22 windows look amazingly great. The machine is super easy to use and so far works like a champ. Very little effort on my part, especially once I came up with a system. I dropped the pads in the washer and I am ready to go the next time. 2 down sides and only 2, in my opinion both are very tolerable. First, for its size, the machine makes a lot of noise, I feel this seeded for the suction process. Robot X5 Window Cleaner - Remote Control, Phone App, Backup UPS 600mAh, 4 Cleaning Modes.thank you good sales.